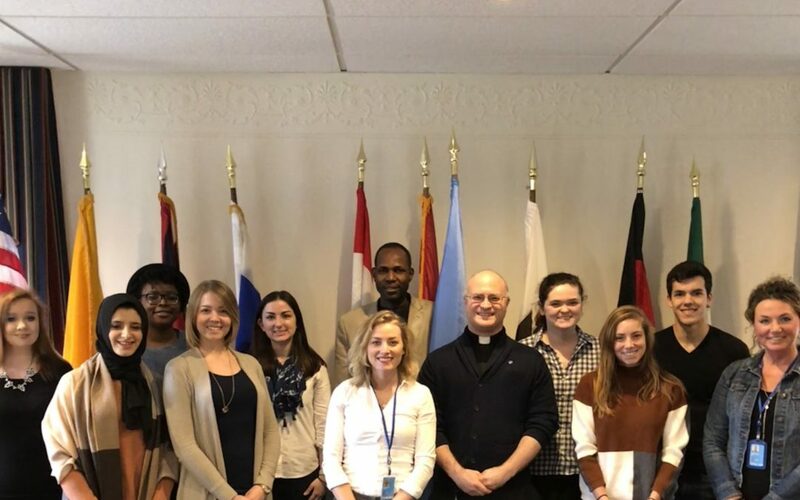 Congratulations to graduate student Roxane Heidrich and undergrad Millie Womble who were named the Spring 2018 UN Youth Representatives for Seton Hall’s School of Diplomacy and International Relations. We are equally as proud to present our eight new UN Digital Representatives, which include graduates Patricia Zanini Graca, Michelle Perez, Ruthly Cadestin, Alexander Miller, and Marcel Yameogo as well as undergraduates Caroline Hall, Halimah Elmariah, Catherine Doolan and Joleen Traynor. Senior representatives Vera Dimpolon and Morgan McMichen as well as the Center’s Director, Fr. Brian Muzas held a training workshop and orientation for all new representatives on Friday, February 9, 2018. Congratulations to our YouthReps and DigitalReps. One step closer to being PermReps one day!